Michael Pachter believes Gamers' Voice is a "crybaby" for complaining about bugs in Black Ops, while Gamers' Voice finds Pachter ignorant of reality. 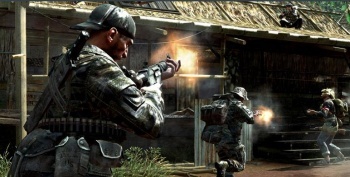 When industry analyst Michael Pachter learned that UK-based advocacy group Gamers' Voice lodged a formal complaint with the Office of Fair Trading over what it claims are buggy PC and PlayStation 3 versions of Call of Duty: Black Ops, he called Gamers' Voice a "crybaby" and said the move was a grab for political attention. Pachter's comments have sparked a debate over just how buggy the final version of a game can be, and how the public should respond if it feels slighted. When IncGamers asked Pachter for his opinion on the Gamers' Voice complaint, he said: "They sound like a crybaby to me. All games are buggy, some more so than others. Have you tried Fallout: New Vegas? Buggiest game ever ... If people don't like it, they can take it back to retail for a refund. Most bugs are patched within a reasonable time, and any serious gamer expects bugs. In my view, this is a blatant stunt by [Gamers' Voice founder and British Parliament member Tom Watson] to grab attention." Gamers' Voice responded to Pachter by calling him ignorant of the organization, which Tom Watson did help to establish but has no hand in the daily operation of, and criticizing his knowledge of how serious it considers Black Ops' bugs to be. "We are not influenced by politicians; we represent gamers who have a variety of concerns," Gamers' Voice said in a press release. "We are reacting to Activision because we've had many, many emails about the game's crippling issues from British (and international) gamers who are unhappy with the buggy product and poor service Activision has provided to PC and PS3 gamers." Gamers' Voice alleges that Black Ops' has "show-stopping" bugs it believes should have been fixed by Activision. To the advocacy group, critics and reviewers aren't a suitable form of communication about these bugs for consumers. Meanwhile, Pachter fired back his response to Gamers' Voice, saying it "seems genuinely unaware about standards for product performance in the UK and elsewhere." "Given that tens of millions of people have managed to play Black Ops for hundreds of millions of hours, I can only conclude that the game works sufficiently well so as to allow for hundreds of millions of hours of game play," Pachter said to CVG in his reply. "The publisher is responsible for delivering a quality experience, not a perfect one ... Gamers' Voice can continue its quixotic quest to cause Activision to respond to a regulatory inquiry, or could take a more traditional approach and try to unite gamers to take a more civilized approach." Pachter points out that Activision is a behemoth, and likely won't be intimidated enough to change its philosophy on game development and hitting the perfect release date, adding: "Consumers can't sue companies that make inferior products, unless they are unsafe, cause health problems, or are not fit for the intended purpose ... Gamers' Voice faces an impossible task in attempting to convince regulators that the game is not fit for its intended purpose." Many gamers are definitely unhappy about the state of Black Ops, so I don't think it's right for Pachter to outright dismiss the attempt by Gamers' Voice to ask for an investigation on the matter. I can certainly see why Activision wouldn't want to miss its launch date for the yearly franchise, but if a product isn't ready, it should be held back. A publisher should be held accountable, but on the other hand, gamers also shouldn't have unreasonable expectations. Are the bugs found in the PC and PlayStation 3 versions of Black Ops severe enough to validate Gamers' Voice's complaint?